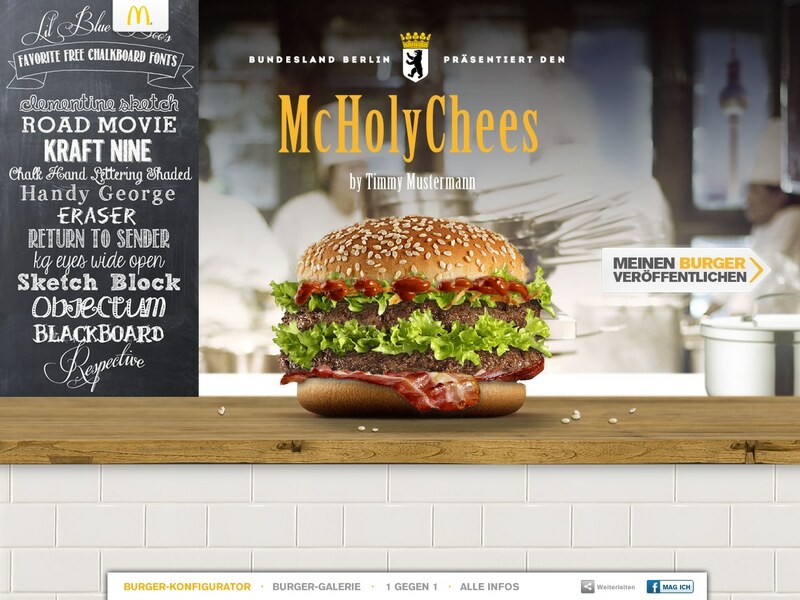 2015 Reboot of the most successful crowd-sourced campaign for McDonald’s, where fans could create virtually their very own Burger plus the chance, to get it served in the real store. To start out with: Some projects land interestingly again and again in my lap. 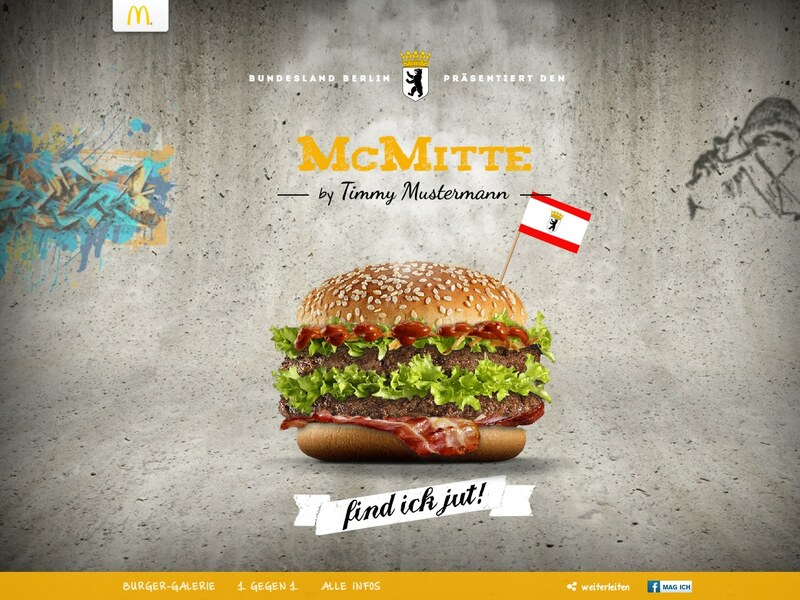 This project for McDonald’s, where the customer can create his or her favorite burger to compete against others, started in 2010 when I initially worked on it. As part of a campaign update in 2015, a new agency Hi-Res! was tasked to bring the project to a new level: away from a flash-microsite to a more mobile compatible and more responsive HTML5 solution. The whole team operated under an extreme tight timeline as the launch was scheduled within 2.5 months and the complexity of the tasks at hand was high. 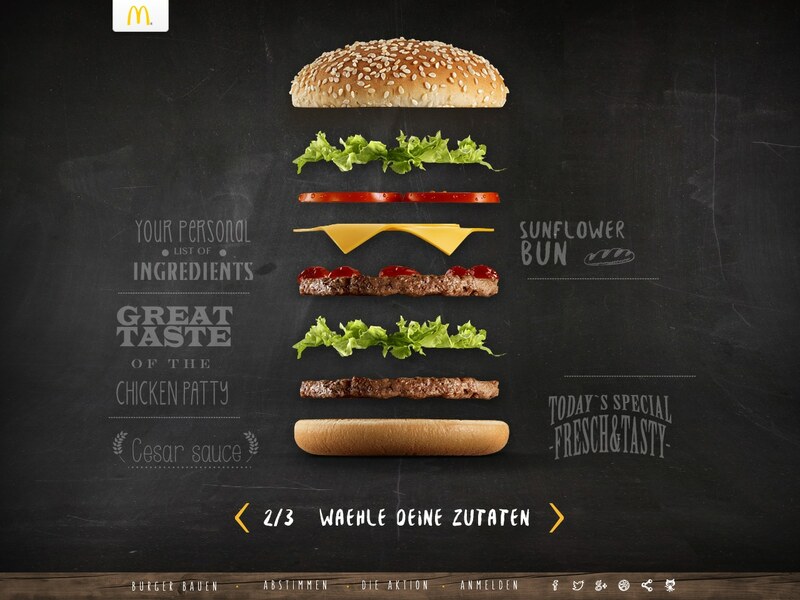 The objectives were to more engage the UX and increase the number of submitted burger creations. 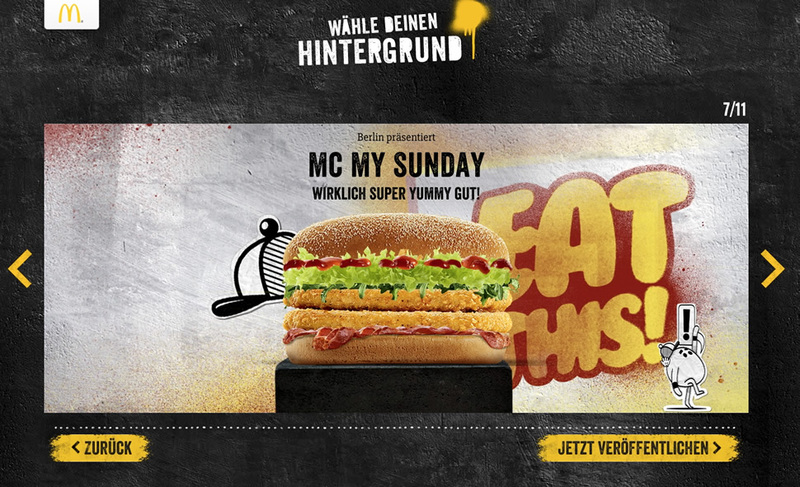 The look and the campaign were jointly developed with the agency Leo’s Think Tank. The initial tool was naturally the website which would not could not have been realized without a super experienced and well-run front-end developer team. 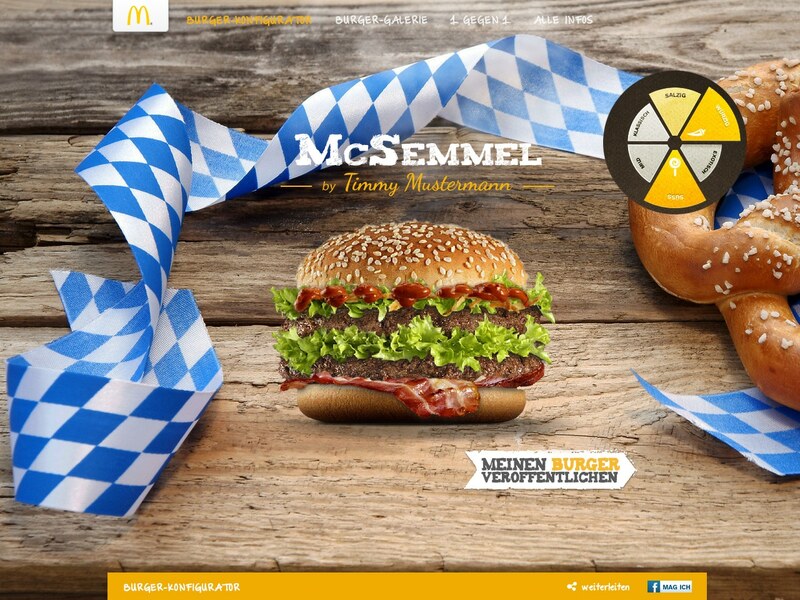 The creation of the burger out of the individual ingredients had to be as easy and intuitive as possible for the UX. 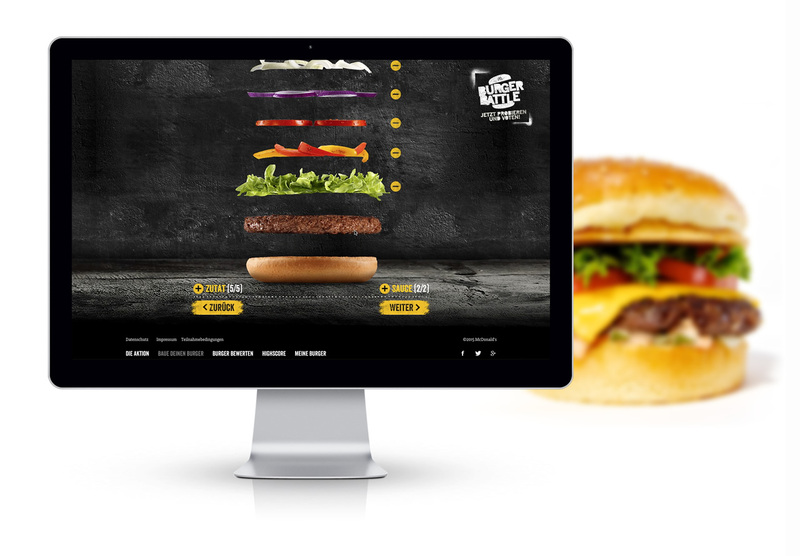 Therefore, we developed an innovative touch-interface with the focus on fun for the UX to configurate the burger and reliable usability across different devices. 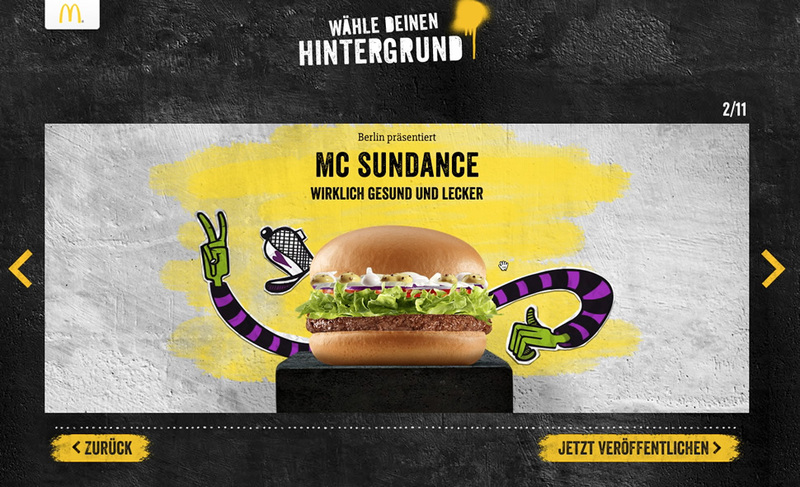 In addition, the nationwide User-Voting campaign for the best burger creations was thoroughly revised. Similarly as in the successful Dating App Tinder, the user can easily decide through a slide-mechanic: delicious or not delicious. 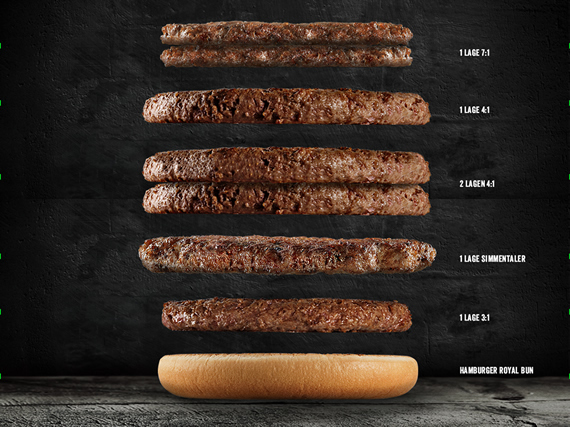 In order to present the self-created burger in the most realistic, appetizing and premium quality manner, a team of specialized food photographers shot each of the 140 possible ingredients as a perfect isolated image. 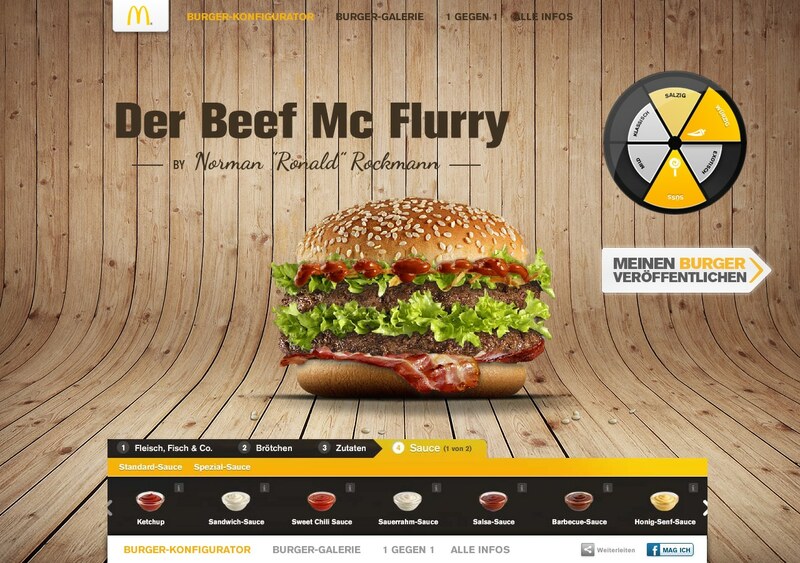 An intelligently programmed interface logic had to be programmed which allowed for dynamically changing layer stacking of the ingredients so that the lettuce and the sauce could be placed where they were supposed to be.  We relatively quickly developed the intuitive "touch & drag" interface with which the user can create his or her own virtual burger faster but most of all with much more fun. 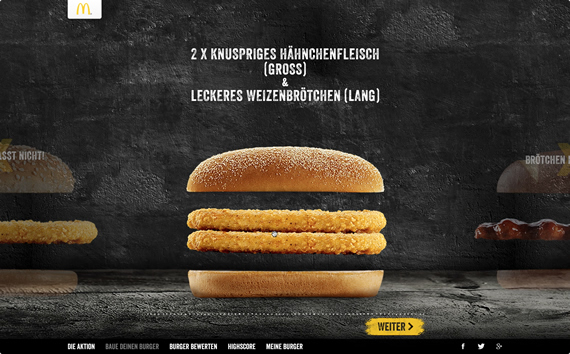 Another special feature of the project has been that the final burger creation had been combined with a high-visibility ad campaign. 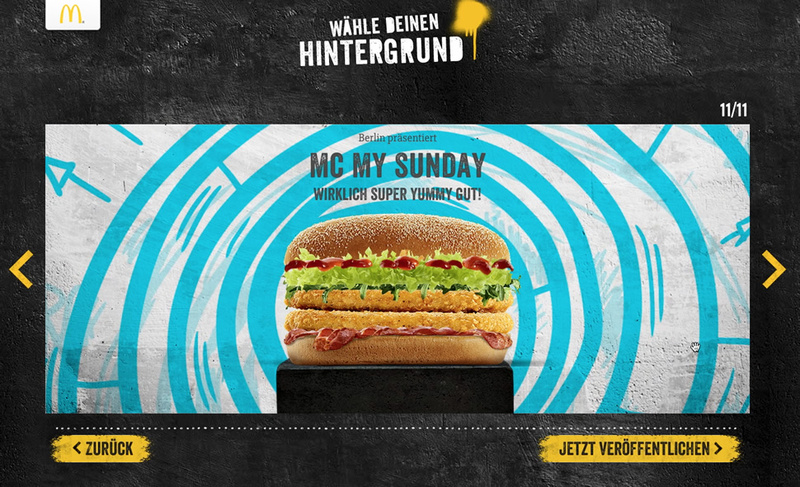 The user was able to select from various themes with numerous background designs and insert a name as well as a slogan for his or her burger creation through a text tool. A blacklist filter (to avoid any misuse) as well as a special editing team were necessary to ensure a certain quality. 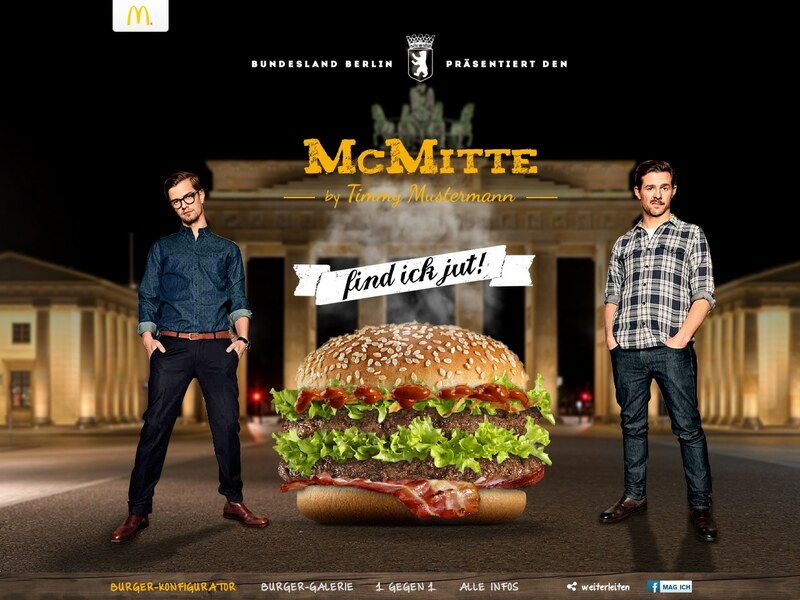 An important success factor of the campaign has been the clever intergration of on-site activities with social media. Through numerous interaction opportunities and the activation of facebook users, youtube and other off-site channels the campaign could create a high buzz. 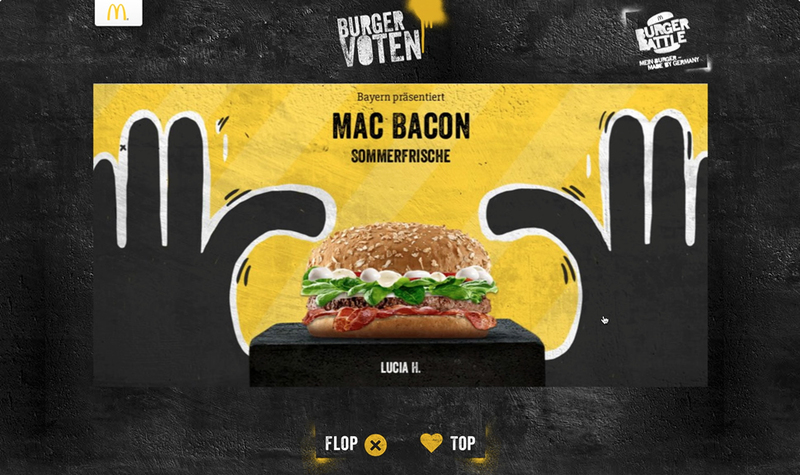 Overall, the cross-media campaign was nationwide a huge success: in only four weeks 187,790 burger recipies and burger creations were uploaded, over 17 million voters- more than ever- casted their vote for the best burger creation. 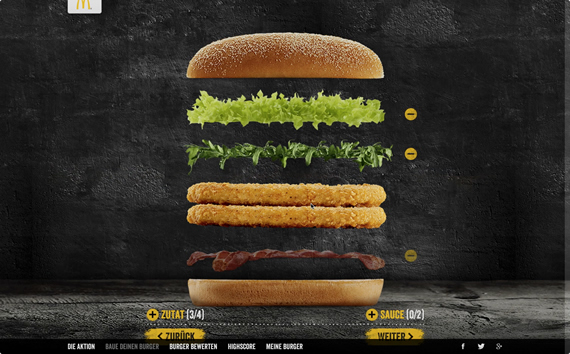 The four finalists made it with their creations to McDonald outlets nationwide, where the rest of the country could directly test them and cast their final vote. The project originally started with a pitch for which a lot of the visual approaches for the campaign look and first broad ideas for the user interface were already developed by the team. A rough and gloomy look with the feeling of street-style and gang battle won at the end.